In addition to artists, writers, and photographers, this retreat would be ideal for pastors. As the owner I can design the experience to meet the needs of the individual. The prices are very modest. 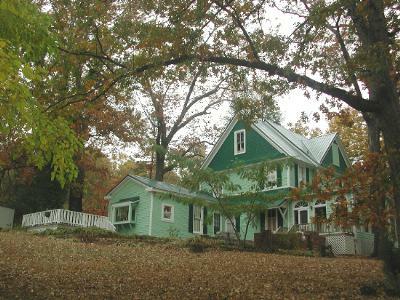 Artist Ann Hamilton opened her 1890's Victorian Home as the Art for Art Lovers Retreat in January, 2009. This fulfilled a dream of hers to provide others with a peaceful sanctuary. Time spent at the retreat is designed to be as structured or unstructured as individuals desire. It is perfect for a day, week or longer of painting, work, study or meditation. Guests have access to a large working studio with easels as well as access to a computer. They can either escape to their spacious bedrooms to rest, study and meditate or to the many nooks and crannies of the retreat. A large wrap-around porch on the front or the deck at the back are two of these places. The art retreat is located in Fort Payne, Alabama (US), minutes from Mentone, Alabama, Lookout Mountain, Desoto State Park, and Little River Canyon.